Call Premier Rental Purchase and order one of our great Living Room Groups like the one above. We offer same day, free delivery, flexible lease options, free service and 120 days same as cash. Call us at 937-278-2000 at Dayton West or 937-256-6000 at Dayton East. With a stylish contemporary flair and a plush cozy design, the “Macie-Brown” upholstery collection becomes the perfect addition to enhance the beauty and comfort of any living area. The pillow top arms and stitched bustle back design surround the supportive seating cushions to create an upholstery collection that is sure to cradle you in comfort. With the warm earth-toned upholstery fabric beautifully embracing the flowing contemporary design, this furniture fits flawlessly into the decor of any living area. 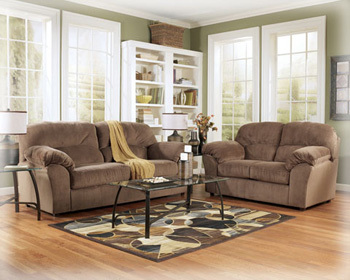 Create a living room to be proud of with the style and comfort of the “Macie-Brown” upholstery collection.